There is nothing in the world like the feeling that the stare of a buffalo sends through your whole body. In my case, not so much fear, but a high-alert, respectful steadiness, an intentional calm, and the serious resolve that such a moment absolutely requires. 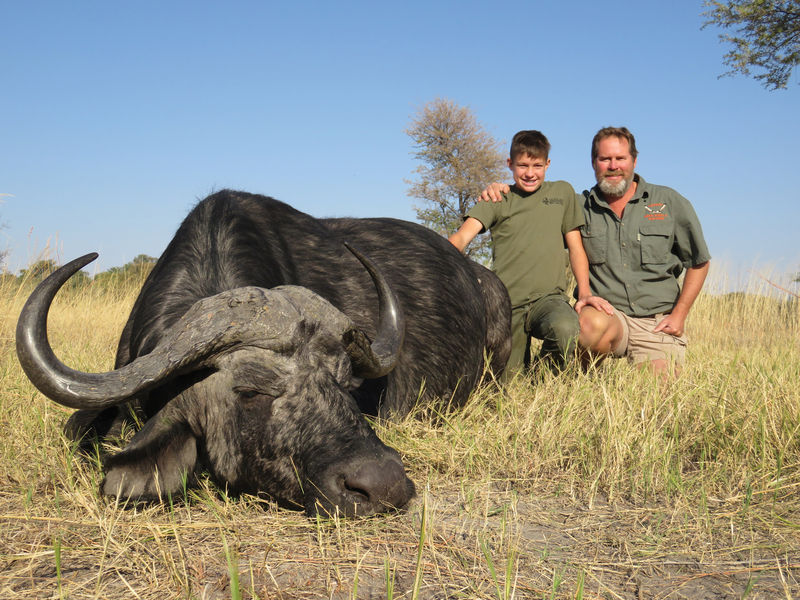 For his second African hunting adventure, Trevor Nakka came to the Caprivi, now called Zambezi Region, one of the legendary hunting destinations in Africa. A region of lush swamps and riverine forests, endless mopane savannahs, impenetrable tall grass, deltas bordering wetlands, plains dissected by multiple perennial and seasonal rivers and ponds. We set out looking for buffalo on the first afternoon. I saw more herds of impala, sounders of warthog and various other plains game than ever before. We spotted random baboons, waterbuck, kudu, roan and sable, but during the next two long days of driving, walking and glassing we saw no buffalo. On the second day, we even caught sight of a big male lion. We approached him by vehicle up to a distance of fewer than 50 metres. He roared at us and loped away into the bush. While that was a wonderful experience, along with watching many elephants, I was a tiny bit dispirited by not seeing any buffalo yet. On the third day I had finally shed my urban self and began to get into the rhythm of the hunt: early mornings, then a siesta, finally evenings around the fire. I was much more relaxed. We started out earlier, as the days were growing longer in late August, with heat increasing and the African summer approaching. We headed out into the bush, towards a great swamp bordered by a vast, open grassy plain – a slightly sloping, tawny-coloured plain dotted with mopane trees that is the epitome of African landscapes. We rolled along and I was thankful for my warm coat, as the airstream on the high seats outside turned out to be chillier than expected. I was lost in my thoughts and the absolute beauty of the morning and the incredible wilderness when the vehicle abruptly halted. You don’t need a lot of experience of Africa to instinctively pull your binoculars to your eyes when the hunting car stops. In the distance, perhaps three kilometres away, we could make out a large herd of buffalo. We started driving again, slowly now, first away from the herd in order to have the wind in our favour and then circled behind a forested bluff where we could hide the vehicle and commence our stalk back towards the herd. After 30 minutes of quiet but purposeful stalking, striding as swiftly as we could without noise, we again spotted the herd in the distance. They were characteristically feeding upwind, and we were now parallel and cross-wind to the herd. If they were to continue in their approximate direction, they would come to a few small hillocks with short, scrubby cover where we might be able to intercept an old bull. We continued to a small bushy hump diagonal to the herd feeding up-wind, and we glassed between the branches of the thick cover for a suitable bull, hoping that our positioning and Dawid’s planning and instincts would be correct: that the herd would approach our spot, and that a mature old bull would come within range. It was a big herd, at least 300 buffalo, spread out over a kilometre. Dawid’s guiding came to fruition sooner than I expected – the herd slowly split around our spot, and we were almost surrounded! Now we were seriously concerned that the herd would sense our presence and start stampeding. We went into a state of absolute silence and alertness, while quietly seeking a bull through the brushy cover of our seemingly insignificant hump. 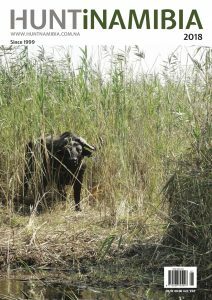 I slowly edged forward to the shooting sticks which Dawid had set up, anticipating the possibility of the herd passing that side of the hump, and very carefully I began to scan the herd through my riflescope, hoping that an old bull would come into sight. While the herd was of course almost all cows, calves and young bulls, a very nice older bull fed closer to us, at around 50 yards, and I tensed somewhat, becoming concerned that our cover was disappearing as the herd began to feed past us. He seemed mature, his boss was good and well developed, but he didn’t have the complete, hard boss that a truly mature bull would possess. He kept feeding upwind, and I started to seek another bull, hoping that an older, bigger bull would emerge at close range as the last remnants of the herd began to pass us. I pivoted my .375 H&H Magnum on the sticks slowly, slowly, one degree at a time, towards the remaining few animals trailing within range at the back of the huge herd. I had quietly pivoted about 10 degrees when indeed the large black form of another bull emerged – bigger, older, heavier – filling my scope not more than 15 metres away! While our cover had been effective up to this point, this was no longer comfortable. By now the herd had almost surrounded our hiding spot – any number of eyes or noses could suddenly detect us. A startled and displeased bull can charge 15 metres in the blink of an eye. This situation demonstrated once again why buffalo is a dangerous game: you must get close for a clean shot, ideally within 40-50 metres, but that often means you have a herd of dangerous animals in close proximity. A stampede or an irritated bull could kill you, and unfortunately, many a hunter has succumbed to this fate. This was very serious now, and my position could turn from hunter to hunted in a millisecond. Dawid had moved to an arm’s length of my right shoulder, and I whispered to him, “He looks good, is he good?” For one of Africa’s respected buffalo PHs, who has successfully guided hunters to hundreds of buffalo, David’s response was, barely audible but brimming with excitement and anticipation, “Yes, he is good – take him when you can”. The bull was still grazing quietly, moving closer, to within 12 metres. For just in case that I hadn’t yet taken my safety catch off, I slowly pushed the steel slide forward, only to have it slip from my finger the last tiny two millimetres. It was enough to click more loudly than the occasion warranted and the bull looked up, straight at me, right into my eyes through the scope. Unflinching, I had the presence of mind to aim the crosshairs between his eyes, on his nose, a precautionary measure as I had no intention to make it a head shot. However, it might become necessary under the circumstances, so I held steady on the bull. The look of that bull will never fade from my memory. Every description of how a buffalo bull looks was brilliantly illustrated at that moment: defiant, bold, perhaps mean, certainly strong, and a bit imperious, with potentially dangerous intent. There is nothing in the world like the feeling a buffalo stare sends through your whole body – in my case, not so much fear, but a high-alert, respectful steadiness, an intentional calm, and the serious resolve that is vitally important in such a situation. I was ready, I didn’t flinch, I was focused and more alive than ever, and at that moment I could feel my life’s experience growing. I firmly stared back through the scope, keeping my body as stock-still as humanly possible. The seconds ticked away… I wasn’t really counting, but I could feel 10 seconds pass, then 20, then something like 30. Finally, the bull settled, put his head down to feed again, our cover just sufficient to avoid his further attention. I breathed steadily, slightly inhaling at the prospect that he might now offer the opportunity for a fatal broadside shot. He moved another yard closer and turned. I levelled the crosshairs on the point of his shoulder, right at the heart, and smoothly pulled the trigger. I knew the shot was good, and David and Zana could see for certain that the bull was hard hit. The herd bolted, the bull ran with them, but I could see that a lone figure began to slow after 50 metres, and the limp of a damaged shoulder and hard shot became evident. After another 20 metres or so, the bull stopped and stood alone. The herd carried on but wasn’t panicked and began to slow after another 100 metres. I had immediately reloaded after my shot, but I could see that it was over. The bull staggered, limped forward and fell over. The herd quietly receded and I was struck by the return to almost complete silence, the stunning beauty and morning light on the plain contributing to the emotions of the moment. My breath was halting. A bittersweet feeling was rising in my body, the kind that comes from being satisfied that you have successfully taken your prey, while also being saddened by ending the life of a great beast. Restraining my emotions and returning to the matter at hand, I wanted death to be quick, to be humane, and we slowly approached the bull, my rifle ready. We stood, with a combination of respect and admiration for a great bull, but also with concern about whether he had in fact expired. For reassurance, I placed a final shot between the shoulders, and he gave his last, long and mournful death bellow. He was gone, and my eyes filled with tears. They didn’t roll down, my emotion was temporary, I choked them back and I wanted to honour the old bull and the moment. I approached him and placed my hands on his beautiful aged and scarred body, and thanked him for his sacrifice. The local village would benefit from his meat, and I would cherish his great head and horns for eternity. It was one of the greatest moments of my life. We took time to honour the great bull, alone on the plain, the morning sun now rising higher into the sky, the warmth steadily gathering, a slight breeze stirring the grass and the leaves on the mopane trees. 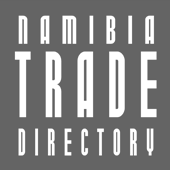 This article was first published in HuntiNamibia 2019.